Ralph Flint, Metropolis, undated. Colored pencil on paper, 12 3/4 x 16 1/8 in. The Phillips Collection, Washington, D.C. Acquired 1931. Currently hung in a small group of New York-themed work on the second floor of the original House, Ralph Flint’s undated drawing Metropolis is nothing if not quietly eye-catching. 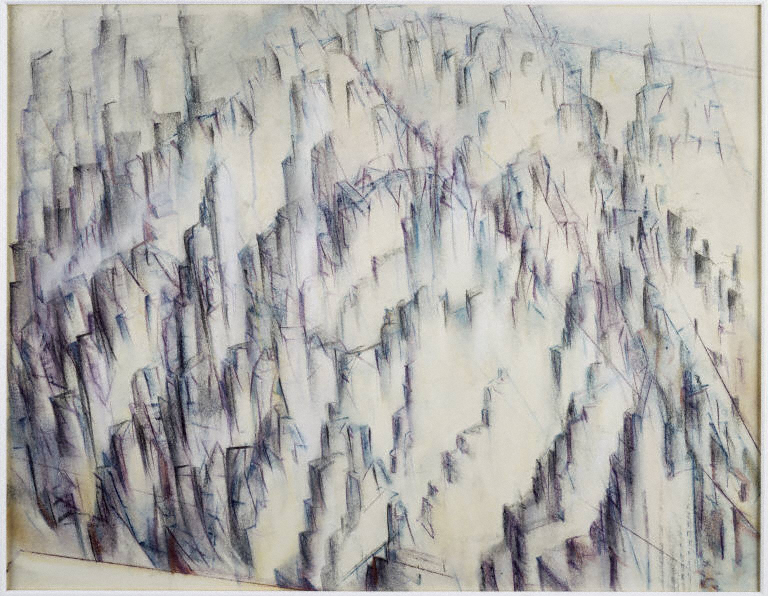 The pencil marks that make up the abstracted cityscape are brusque and smudgy, lending the elevated view a feeling of out-of-reach frenzy. White highlights add depth to the relatively sparse work on paper, and the whole effect of Flint’s hand is understated and enchanting. As spellbound as I found myself when first viewing it, these visual qualities were not what prompted me to learn more about the piece. Rather, it was the unusual notation on wall text beside the drawing: “death date unknown.” Imprecise birth and death dates are probably not uncommon in exhibitions of ancient art; but as this is a modern piece, I was surprised and highly intrigued by the apparent gap in knowledge about Flint. Furthermore, word among staff was that Metropolis had never previously been on view at the Phillips. Installations Manager Bill Koberg wasn’t able to resolutely confirm this but did tell me that the work was unframed when he decided to put it up. As a fan of puzzles and mystery, I was immediately intent on finding out more. And so, I journeyed to every casual art detective’s first stop: the library. There, the Phillips librarians helped me piece together a spotty portrait of Ralph Flint. His biography in Who Was Who in American Art 1564-1975 describes him as a “painter, lecturer, writer” who studied at the Académie Julian and with J.P. Laurens in Italy at the turn of the 20th century. Flint contributed to the second and last issue of Phillips’s art magazine Art and Understanding published in March 1930 with the essay “Current American Art Season,” a review of exhibitions on view at the time. These minimal clues were interesting, but didn’t really help me learn about Flint as an artist in any specific way. The piece on display–as well as the other Flint held by the Phillips–are decidedly modern colored pencil drawings, not paintings. If Flint had studied (presumably) classical painting, how can we explain his evolution into the artist that created the works acquired by the Phillips? And how did he come to be a critic? Well, an answer of sorts did surface, but it wasn’t at all what I expected. Check back in a few days to see what I found out!